Do you have some social media marketing questions? It’s safe to say that social media has completely revolutionized our society. Or at the very least, the way we communicate. In 2018, the number of social media users of social media users is projected to reach 2.62 billion. And that’s quite a lot of people, considering the fact that there are 7,6 billion people in this world. And as a marketer, you need to realize that you’re only trading on one thing: attention. Where your audience’s attention is, that’s where you should be. There’s no real point of running television ads if no-one is watching the television, nor is there any point to run a television ad, even if there are people watching, if none of those people are within your target audience, right? As people’s attention has quickly moved from things like television, and onto social media, there’s no doubt that the attention is to be found there. And when you remember that marketers only trade on one thing, it isn’t that surprising that more brands than ever are leveraging social media for marketing. Because that’s where the attention of their audience is. But being that social media is still something very new, and social media marketing being something even newer, it’s not surprising that a lot of marketers and brands ask social media questions, such as how it can be leveraged for marketing, and what is needed to succeed with social media marketing. In this post, I am therefore listing all of the most asked social media marketing questions, and answer them. There are a lot of questions, so let’s just dig right in. It wasn’t that long ago that social media was considered to be a fad and something that wasn’t worth paying attention to. Of course, we’ve evolved a lot since them, and that people ask this social media marketing question is not that strange, really, because we’re always a bit skeptical about something at first, especially if it means we might have to let go of things that aren’t working very well anymore. As mentioned earlier, marketers trade on attention. And when you look at the number of social media users, you can quickly see that social media has no lack of it. In order to succeed in marketing, brands need to be where their audience is, and right now, people are on social media. In fact, most brands will be able to find and reach their target audience on social media, but there are always exceptions. For instance if your target audience consists of people who are between 70 and 90 years old, chances are, you don’t need to be on social media, because that’s not where your target audience is, however, for the vast majority of brands, their target audience is to be found on social media, and that gives no reason not to be on social media. In fact, your customers expect you to be on social media. A study found that 52% of Customers Expect brands to respond to them on social media, and that obviously demands you to actually use it. Now, I could go on all day presenting all the statistics that prove how effective social media is to brands, but if you look beyond the marketing statistics that social media has proven to be able to generate for brands, the fact that your customers expect you to be on social media and be active should be convincing enough. Because 90% of customers say social media availability affects brand loyalty. One of the most important reasons to be on social media is so that you can meet your customers’ demand, but you also want to have in mind that social media has now been the place where people take their conversations and where they talk to their friends. This means that they will also talk about their brand experiences, leave reviews, complain and ask questions. And if you aren’t there to meet that, it’s impossible for you to know what your customers are saying, and take appropriate action. Lastly, never in the history of this earth have brands had an opportunity as amazing as social media to interact with their audience and improve their relationships with them, and if you’re not taking advantage of that, you’re literally leaving money on the table. So, for the vast majority of brands, with very few exceptions, yes, you need social media. What impact does social media marketing have on businesses? Social media marketing has shown to be able to help brands generate incredible marketing results, in an array of different areas and metrics. The reality is that social media is just a tool in which brands can use to reach their target audience and work on their objectives, and when you think of social media that way, it gets very clear that it is mostly about how you use it that affects the answer to this question. An electric screwdriver is worthless if it doesn’t have any battery, right? But the starting point of all social media results and metrics is always people’s attention.Then, how you use it to benefit your business, that’s a completely different story, but when you have people’s attention, and more importantly, your target audience’s attention, you can achieve virtually any marketing objective. Whether you know it or not, people are talking about your brand on social media, and if you aren’t there to listen, you’re missing out on information that can be crucial to your brand. By using social media, and social listening, you can understand the problems your customers are facing, understand how you can improve, as well as what you can do to improve. You can also identify angry customers and help them solve their problems. This is the most basic benefit of social media marketing that comes by just reaching your target audience and getting in front of it. By simply being on social media, engaging with peoples and growing your reach, you can reach a ton of new people, and thus increase the brand awareness, making people aware of your existence. When you have people’s attention, you can get them to do things for you, and when you have brand awareness, more people are aware of your brand’s existence, and will, therefore, visit your website. Essentially, brand loyalty is built following built relationships, and in that sense, they’re very much connected. A problem with social media marketing, however, is that some marketers see social media as just another marketing source, and therefore, the idea is that the more promotional messages and content you put out, the better results you’ll generate, because that’s how display ads work, that’s how television ads work, and so on. But with social media it is different. Marketers shouldn’t see social media as a promotional tool, but a relationship tool that they can use to get closer to their audience, and as a result increase brand awareness, and ultimately build their relationships with them, which in turn will lead to increased loyalty and the making of loyal supporters of your brand. So if you understand that people aren’t on social media because they are eager to have ads shoved in their face, and instead use social media as a relationship tool, social media marketing can have a huge impact on your business, positively. How do I measure the ROI of social media marketing? And is it possible? There’s a common misconception that it isn’t possible to measure the ROI of social media, but that is just not true. Because the marketers who believe that just don’t know how to do it, and what they should look at when measuring. With the right strategies, and by looking at the right metrics, measuring the ROI of social media marketing is not harder than any other marketing efforts, in fact, it can even be easier, but marketers seem to struggle with this, since Fast Company found that 88% of marketers felt they couldn’t accurately measure the effectiveness of their social media campaigns. And as a result of this, the misconception that it isn’t possible to measure the ROI of social media marketing has evolved. Social media marketing can generate results within a ton of different metrics, a few of which listed above, and as a result, it can be tricky to know in which end you should begin. When it comes to measuring the ROI of social media marketing, it is just important that you know what you should look at when measuring different metrics, but it is important to have in mind that all of these metrics (among many others) are metrics that other marketing efforts can generate too. What I mean by that is that you have to have in mind that social media marketing is not a lot different than other marketing sources. For instance, how do you measure the brand-awareness generated from a television campaign? It’s the same challenge there, but people seem to become so afraid when it comes to something new. In order to understand the full marketing benefits of social media marketing, it is important that you don’t neglect some metrics, just because you’re so focused on the results you generated in one, or a few. Because even if you focus on generating results within one metric, you can drive results within many other metrics at the same time, so if you’re just evaluating the metric you focused on, you won’t get the whole picture of just how beneficial social media has been for your brand. You should always measure results from your efforts. A condition for being able to do so, is however that you have created a social media strategy. It’s not impossible to measure the results of your social media efforts if you haven’t created a strategy, however, it is a lot easier when you have one. When you have a social media strategy in place, you will also have your goals and objectives with social media in place. Because your strategy should include just that. Therefore, when it’s time to measure the results, having your goals in place makes it easy for you to know where you’re going to start measuring. And the truth is that there’s a lot of metrics that can be worked on social media, and a lot of things social media can do for you. But in first hand, you want to focus on the metrics that you’ve set as goals because otherwise, it can quickly get overwhelming. So how does this save you time and allow you to generate better results on social media? It prevents you from doing things that aren’t helping you generate any results, that’s how. The thing is, you can do a lot of things in the belief that they are working, but unless you actually measure and see if they are working, it will be hard to find out. This means that you’re wasting both time and effort on things that aren’t benefiting you. And by identifying the things that are working, and those that don’t, you can tweak your strategy and make it perform even better. Lastly, when talking about the ROI of something, it is often spoken about in terms of how much money it made you, but let’s say that your goal is to use social media to improve your customer relationships, then, the ROI of social media is the number of relationships that you were able to build, and ultimately, if you look at it more long-term, what those relationships mean to your brand. A social media marketing strategy is just what it sounds like: a strategy for how you’re going to manage your social media marketing. In marketing, you should have strategies for everything you do, because having them allows you to know exactly what needs to be done, how you’re going to do it, and look back to make sure that your efforts are backing up your goals and objectives. 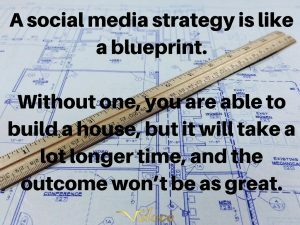 You can think of a social media strategy as a blueprint. It is possible to build a house without a blueprint, but chances are, it will take a lot longer time to build what you want to build, and the outcome won’t be as good as it could have been if you would have used a blueprint. If you don’t have a social media strategy, you’re essentially operating in the dark, and have no real plans for what you’re going to do, how you’re going to do it, and how the things you do will support your goals. By developing a strategy, you’ll be able to save time, while at the same time generating better results. How can I create a social media strategy? A social media strategy is not a lot different from strategies with other marketing sources. What are your goals? What do you hope to achieve with social media, and why are you using it? Who is your target audience? Where do they spend their time, what are their pain points, and how are you going to reach them? What type of content are you going to create and share? What content are you best at creating? How can you create content that your target audience will care about and find appealing? What social media platforms are you going to use, and what campaigns are you going to run to support your objectives? How often will you post and be active on each channel? How will you measure your results and the ROI of your social media marketing efforts? How will you be able to identify if you’ve reached your goals? Social media marketing questions: Should I pay for marketing? The answer is probably yes – but only if you want. Social media marketing has shown itself able to generate amazing marketing results, by only leveraging the organic reach on the different social media platforms. You can run campaigns such as giveaways and competition to help you gain traction, to build a large audience, and to engage your audience, but by leveraging ads on the different social media platforms, you can boost your results and let your money work for you, because working to only generate results with the organic reach is both challenging, time-consuming, and tricky, especially you don’t have a solid strategy in place. All of the top social media platforms have attention, and when you have a lot of attention as a brand, that’s when you can start making money. And this is also the way the vast majority of social media platforms make their money: by offering ads to brands in order to reach more people. Instagram has ads, Snapchat has ads, Facebook has ads, Twitter has ads, and so on. And by paying, you can reach a much larger audience, without having to arrange a ton of social media marketing campaigns to help you generate results on social media. Simply put, social media ads means putting your strategy on steroids. Most social media ads have shown to be tremendously effective for brands and have shown for an incredible ROI, and an important reason for that is the immense targeting that they offer. People who use social media follow different people do different things, like different pages, and so on, and everything you do, like it or not, is registered by the platform in order to better understand your behavior, what you like and what you dislike. This means that with all of this information, marketers can run laser targeted ads, and thereby only reach the people who truly matter to their brand, and as a result, achieve a sky-high ROI. While social media ads are tremendously popular, with Facebook being the most effective and most popular marketing source, other marketing investments on social media that demand you to pay, for instance by leveraging influencers who promote your brand has shown to be extremely effective as well. So, yes, you should pay for marketing on social media, because it can help you skyrocket the results you’re already generating organically, and help you reach your goals faster. And since most major corporates haven’t yet realized the true potential of social media marketing yet, and thus not started pouring the majority of their marketing budgets into it, like they do on traditional marketing sources that are losing efficiency, this kind of paid marketing on social media is still an arbitrage of underpriced attention. Is it okay to post promotional content on social media? Yes, but this ties back to what I mentioned about social media marketing earlier. Firstly, you need to realize the reason why people are using social media because this affects how you should leverage social media as a marketing tool. People are using social media to connect with their friends, stay updated with what people are doing, and most importantly, to be entertained in one way or another. Most importantly, you need to realize that people aren’t using social media because they want to have ads shoved down their throats. But an issue some marketers have is that they think social media is exactly just like any other marketing source, while in fact, it is not. Because with traditional marketing sources, you generate marketing results by shoving ads down your audience’s throats until they choke and buy from you. But with social media, that’s not the case. And when I am saying that, I am mainly focusing on organic social media, even though you should have this in mind when creating your paid social media ads, too, so that you design them in a non-intrusive and seamless way. Now, this does not mean that you can’t post promotional content on social media because you can, it just means that you should do it moderately. A rule that is often spoken about is the 80/20 rule where you share 80 percent non-promotional content and 20% promotional content. And because I think this point is so incredibly important for marketers, in fact, one of the most fundamental to reaching success on social media, I won’t let it go just yet. If you want to generate great results on social media, the best way to do so is to provide your audience value. And this is done with the content you share. Because the content you share on social media is your value proposition and what will ultimately attract people to you. If you don’t have content, you have nothing, and this gives people zero reasons to follow you. Today, there are also more users on social media than ever, and thus more content than ever that is being shared, meaning the competition of getting seen is tremendously tough, making it difficult to cut through the noise. This puts a great importance on the content you share because if it isn’t providing your audience with value, they won’t hesitate to click the unfollow button and go to your competitors. So the fact of the matter is that you can actually generate better results by focusing on providing your audience will content that will bring them value in one way or another, as opposed to sharing promotional content the will scare them away. Now, this does of course not mean that you can’t post promotional content on social media, but you need to understand that the best way to attract an audience isn’t by sharing promotional content, but by sharing content that brings your audience value. Because what this will do apart from help you build an audience, is that it will lead to reciprocity, which means your audience will feel the urge to repay you in one way or another as thank you for all the value you have provided them with, and that ”thank you” might be that they purchase from you. 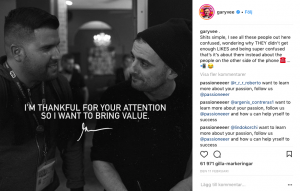 A firm believer in this strategy is entrepreneur and social media guru Gary Vaynerchuk, who has also written the book ”Jab, Jab, Jab, Right Hook”, which is focused on the phenomenon on providing your audience with value, as the title loosely translates to ”give, give, give, and then ask”. Think about it: you’re a lot more likely to give something to someone who has given you a ton of things as opposed to someone who hasn’t given you anything. A give-give relationship is a lot more sustainable than a give-take relationship. Should I use social media for customer service? In fact, people expect you to! Since more and more people are using social media, and spending more and more time on it, social media has become the natural way to reach out to brands. People don’t want to send emails and wait 24 hours for a response, and no-one wants to sit in a customer service phone line with 30 people in front of them when they can just shoot a message to the brand on social media. They’re already on social media, so why use anything else to reach out to brands, right? 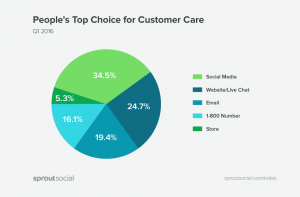 A study by SproutSocial found that 34.5% of people prefer social media as a tool for customer service, and that number is continuingly increasing in the pace that social media takes up more of our time, and more and more people start using it. Moreover, an important reason that people reach out to brands on social media is that they expect quick responses. 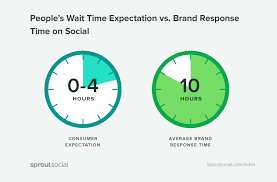 In fact, most people expect brands to respond within 4 hours on social media. When you are going to use social media for customer service, you, therefore, need to put great emphasis on quick responses. because your customers aren’t just expecting you to respond, they expect you to respond quickly. 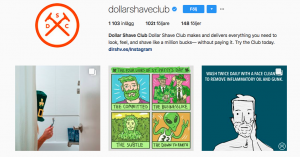 How can I turn my social media followers into customers? This is a very interesting social media marketing question, and it is interesting, because too many marketers focus on simply growing their following base, and many of them do so in the over-belief of what it will lead to. Nowadays, everyone wants more followers on social media. But the truth is that the number in your profile means nothing. It is what the number in your profile resembles that is interesting. As a result, too many marketers focus on building a huge audience, with no plan on who and what that audience will consist of. And then, they get disappointed when that audience isn’t converting. The truth is that it is a lot better to have a thousand highly engaged and targeted followers, as opposed to 10K uninterested and irrelevant followers. But let’s say you have a relevant audience base of people who are genuinely interested in your brand, but still, they don’t see to convert. With social media, it’s not a lot of different than with any other marketing method, and what do you do then to get them to convert? Maybe you optimize your landing page, or maybe you lower your price. All of those things are basic strategies for increasing sales, and the same principle obviously goes for social media too – it’s just a different way of reaching your prospects. Another reason that your followers aren’t converting might be that you just don’t have enough followers or enough reach. A way can, therefore, be to increase your reach and increase your followers. A great way is to do this is to leverage ads. But assuming your followers are relevant and targeted to your brand, the best way to get people to buy from you is to provide them with more value. If they aren’t converting, it might be because you haven’t provided them with enough value. Understand your audience’s pain points, and don’t make it all about you. Make your followers a part of the conversation and engage and interact with them on a regular basis. Have you ever thought the thought that you sell more by trying less desperately to sell? Focus on building stronger relationships with your existing followers and making them more loyal to your brand, while at the same time providing them with content that brings them value, and then, go in for the jab, where you ask them for the sale. A highly popular way of engaging followers and getting them to convert on social media is also to run giveaways and contests, something that has proven to work extremely well. Can I use social media as a customer service tool instead of running surveys? Yes, and social media is tremendously effective for just that. As mentioned earlier, people are talking about your brand on social media, whether you know it or not – directly or indirectly. And if you aren’t using social media to listen what people are saying about your brand on social media, you’re missing out on tremendously valuable information. 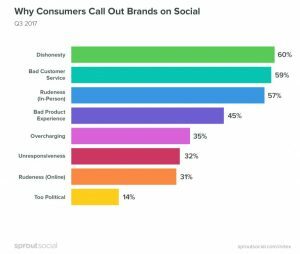 The days of running surveys and customer satisfaction calls are over with social media because people are talking about your brand on social media. You just need to listen to them. Make social listening a part of your social media marketing strategy, and you will get lots of valuable insights into what your customers think about your brand and how they perceive it. 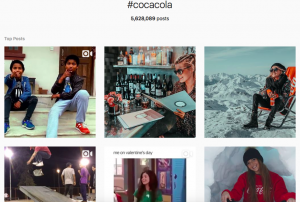 If you search for the hashtag #Cocacola on Instagram, for instance, you’ll see that there are well over 5 million posts shared using that hashtag. And among those 5 million posts is a lot of valuable information if Coca-Cola would just take the time to listen. And remember, that is just one of many places where conversations about your brand can take place. You can either do your social listening manually or with the help of social listening tools. There are plenty of social listening tools, so you’ll just have to find one that suits your brand’s needs. What future social media trends can we expect? The future is never sure until it is the past. But the best way to predict the future is by looking at the past. 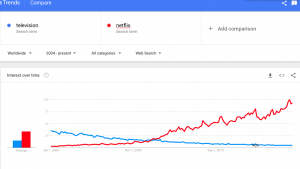 And if you plan on trends that are up and coming within the next few years, you can look at the tendencies in social media and in which direction it seems to be going. An obvious trend that will become more and obvious on social media is that the competition will continue to get tougher and tougher. This is a result of the increased number of social media users, the increased number of brands that use social media for marketing, and most importantly, the number of brands who realize the immense potential that lies in social media marketing and therefore implement it into their marketing strategy. An observation that can be made is that video is becoming increasingly popular on social media. Instagram, Snapchat, and many other platforms have all embraced video, and more and more video is continuingly being put out. And it’s not that strange video content is becoming increasingly popular, because the human brain resonates a lot better with visual content than text. And if a photo says more than a thousand words, what does a video say? In 2016, Facebook hit a total of 100 million hours of video being watched every day on the platform. And this statistics alone proves that the interest in video content is greater than ever, and your customers expect it from you. So what should you do? You should give it to them, of course! Video is also great for your brand marketing-wise, as video allows you to convey your message better, and impact your audience more deeply. Another direction that social media is going in is live video. More and more social media platforms have implemented live video on their platform, and more and more brands have also made it part of their social media strategy. Live video allows you to give your audience rawer, in-the-moment, and behind-the-scenes content, which people love seeing, as it takes away all the filters, and all the photos edited to perfection. Social media marketing questions: Do I need a social media manager? That question can be answered in the same way you ask the question if you need an employee. Do you have the time to do it yourself? Is it worth investing the time yourself? Do you know how to do it?. If the answer to all of those, or some of them are no, then yes, you need a social media manager. Some marketers believe that all you need to do is set up an account, share a few posts, and then kick your feet up on the table and wait for the results to roll in, but that’s not the case. It might have been the case in the dawn of social media when the competition was super low, but it certainly isn’t the case today. If you’re going to succeed with social media marketing in today’s competitive landscape, you need a strong social media strategy, you need to know how you develop a strong strategy, and you need to execute consistently. Some people believe that all that is demanded to run a successful social media page is to just share posts, but that’s only true if you want lousy results. There’s so much more than that, which includes social listening, customer service, relationship building, engaging, planning, campaigns, and much more. If you don’t have the expertise nor time to do it, you should most definitely get help from a social media manager. 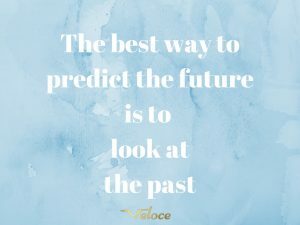 Feel free to reach out to us at Veloce for help! Email me at Jens@velocenetwork.com and I’ll personally assist you. The boring but true answer is what your audience wants to see. I’ve spoken quite a lot about the importance of providing value to your audience. And on social media, the main value proposition you have is your content. Doing this puts a demand on you to understand your target audience and their needs. Firstly, the content you share must be relevant and appealing to your target audience. For instance, if your followers are interested in skiing, it wouldn’t make sense for you to start posting content of snowboarding because your target audience won’t care a lot for that. Moreover, you also want to provide your audience with value in one way or another with the content you share. And to do this, you need to understand why your audience is on social media, and more specifically, following you. Do they follow you for inspirational posts? Are they following you because they want to get knowledge? Are they following you because they want to be entertained? Accordingly, you can start optimizing your content to better suit your audience’s needs. Lastly, since more content than ever is being put out on social media, you simply cannot afford to compromise on quality. It is better to share fewer high-quality posts than to share a ton of posts and let quantity compromise your quality. Which social media platform(s) should I choose for my brand? Do I have to use all? There are a ton of social media platforms out there that you can choose from, and choosing them isn’t that easy. THere’s a misconception that the more social platforms you’re on, the more people you’ll reach, but unless you have tons of resources to manage them, it is much better to choose a few social platforms and focus on them. Otherwise, you’ll end up spreading yourself thin and generating average results among many, instead of generating amazing results across a selected few platforms. When choosing platforms to use, you should mainly look at the user demographics of the different social platforms. Pinterest, for example, has a lot more female users than male, so therefore, if your target audience consists of men, it is probably not the best platform for your brand. Secondly, you also want to think about what type of content the platform is focused on. YouTube, for instance, is only focused on video content, whereas Instagram is mainly focused on photos. So if you are better at creating video content as opposed to photos, you should probably use social platforms that allow you to share video content. The number of posts you should share depends on your audience because it is for your content audience that you share posts. 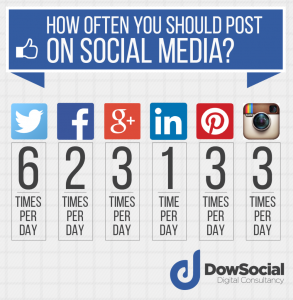 The number of posts also depends on the platform you are using, as the number varies between platforms. Studies have been made that have found different numbers that are the ideal number of posts for different platforms, but you should take these numbers with a pinch of salt, as the ideal number of posts on each platform depends on different factors, such as your audience, and how much content they would like to see. You can use the numbers as a starting point, and then try out to see which number of posts for each platform is ideal for you. Back in the days, when the social media platforms weren’t run by algorithms that decide what content you saw in your feed, the time of which you shared your post was a lot more important than it is today. That’s because the social media feeds were chronological, meaning the most recent posts from people you followed were presented at the top and the oldest at the bottom. As a result, you wanted to post at a time when the majority of your followers were active so more people would see it. But today, the vast majorities of social media platforms use an algorithm that decides the posts that you see in your feed, as more content than what can be consumed is being put out. Therefore, the algorithms are created so that the most relevant posts are presented in your feed. Or more correctly, the posts that the algorithms believe you will find most interesting. And this has lead to the time of which you share a post on social media not being as important as it used to be. But that is not to say that it is completely irrelevant because one ranking factor of content is just time. There are tons of studies that have been made on this that look at the exact hour and minute, down to the second when the best time to post is, but with the things mentioned above in mind, I won’t present that. Plus, the best time to post varies based on your audience, as people from different time zones will be active on social media at different times. Therefore, there is no universal time to post on social media, because it depends both on your audience and the platform you use, so the best advice is to try out and experiment. The truth is, it takes a long time to master something. And since social media is still very young, and many brands are just now realizing the importance of incorporating social media into their marketing strategies, inevitably, there’s a lot of questions that pop up. Hopefully, you found the answers you were looking for and learned something new. If you still have questions, don’t hesitate to let me know in the comment section below! PrevFacebook eller Instagram: Vilken Plattform är Bäst för Marknadsföring?